Tendinitis: Stiffness and soreness in the tendons of the shoulder generally caused by over use. If proper care is not provided, tendinitis can degenerate into actual tearing of the muscle tissue as we age. Bursitis: Inflammation of the bursa sacs, which reduces free space in the joint and restricts movement. Bursitis usually goes hand-in-hand with tendinitis and is treated much the same. Rotator Cuff Injuries: Tears in the rotator cuff (the group of muscles encircling the shoulder joint) can be caused by the progressive worsening of tendinitis, repetitive strain through overuse or trauma. Osteoarthritis: A condition in which the joint cartilage deteriorates and the joint becomes gritty and rough. Can be caused by things like trauma, disease and infection. The AC joint in the shoulder is particularly susceptible because it degenerates faster than any other joint in the body. 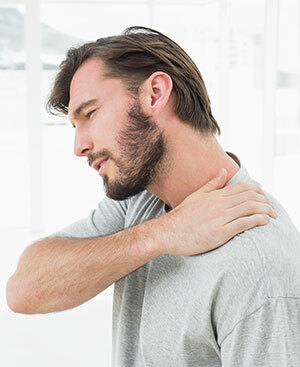 Impingement Syndrome: This occurs when the rotator cuff tendons and bursa (a sac between the tendons and the bony roof of the shoulder joint), become irritated with repeated rubbing. Impingement syndrome is commonly caused by continuously working the arms overhead, repeated throwing activities, or other repetitive actions such as weight lifting and swimming. Adhesive Capsulitis (Frozen Shoulder): The causes of frozen shoulder are largely unknown. One theory is that it is caused by an autoimmune reaction, which can cause an intense inflammatory reaction in the ligament tissue of the shoulder joint. This inflammation leads to pain and rapid loss of range of motion. This pain and tightness in the shoulder can make it difficult to perform essential daily activities like getting dressed. Shoulder Instability: For some people, the shoulder joint is too loose and moves around too much within the socket. In some cases, the unstable shoulder slips out of the socket and becomes dislocated. 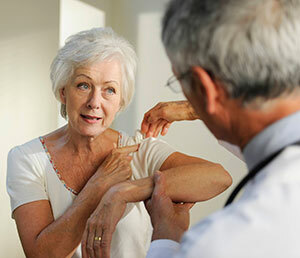 If not treated, shoulder instability can lead to arthritis. The primary cause of an unstable shoulder is a previous injury that caused a dislocation. The ligaments that hold the shoulder in the socket may have become stretched or torn. An unstable shoulder can also result from less severe shoulder injuries. We are committed to giving 100% of our expertise and effort to every shoulder injury patient at all times. This means that your dedicated physical therapist works one-on-one with you through every minute of every rehab session – providing expert assessment and guidance, and constant encouragement and support. In other rehab facilities, you may not always work with the same physical therapist, or you may work with a PT assistant instead. And often, your therapist may work with several other patients at the same time. These factors can make it difficult to get the level of care you need to achieve a full and fast recovery. That’s why our rehab care is always provided ONE therapist to ONE patient. ONE at a time. EVERY TIME. ProFitness AdvantageSM. And it’s what helps us achieve such excellent results. For more information on shoulder pain, download this brochure.